PR6 interview dock - the Home Office looks to approve body worn video cameras to be used during Police interviews. Today the Home Office looks to approve new regulations that will enable Police Officers to use body worn video cameras to interview suspects. Using body worn cameras to interview suspects will save time and bring greater efficiency to frontline Policing, allowing Police to use their body worn video cameras to interview suspects at the scene or within an interview room at the Police station. 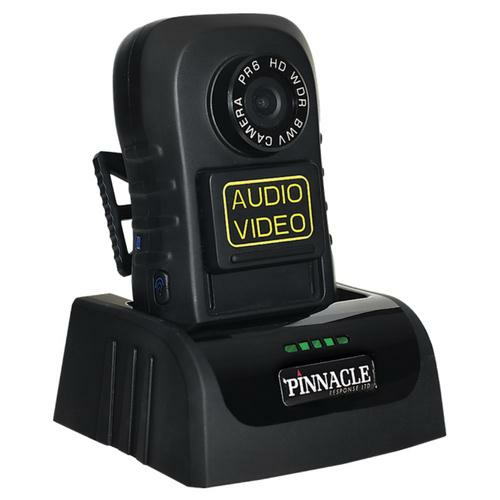 Each PR6 body worn camera, as standard is supplied with a fast charge dock that doubles as an interview dock, a sturdy base for any interview environment. 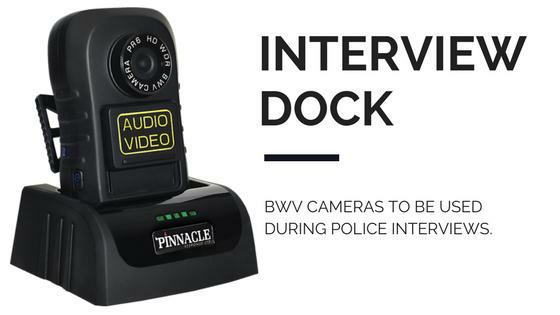 The interview dock will provide utmost support for the BWV camera during the interview with no risk of the camera falling over. The Pinnacle PR6 dock will not move if the interview table is shaken or nudged, whereas the same can not be assured with a flat bottom camera. PR6 Body worn video footage can add valued protection for interviewees due the secure levels of encryption. BWV - Advanced Facial Tracking Redaction Software : Coming soon!